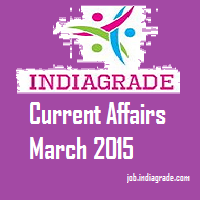 Current Affairs of 1st March 2015: From now INDIAGRADE(job.indiagrade.com) daily update the current affairs from our website. Current affairs is one of main thing while preparing for competitive exams like SSC, UPSC, IBPS and other national/state level examination. We request you to visit this site regular to know the current affairs in every day. You can check the today current affairs that is 01.03.2015 important updates. Like our Facebook, Twitter, Google +, Linkedin, Pinterest page to get the latest updates through social media. Pakistan beat Zimbabwe by 20 runs and register first win in World Cup 2015. Sri Lanka beat England by nine wickets and get third win in world cup. Jagmohan Dalmiya, former Indian BCCI president appointed as a president of BCCI again and Anurag Thakur is New Secretary. Myanmar captures rare white elephant in western jungles. Mufti Sayeed takes Sworn as J&K Chief Minister. Kannan Ramesh Appointed as Judicial Commissioner to Singapore Supreme Court. Arun K Singh to be India's next ambassador to the United States. Union Government blocked private email network for official work.